A-1 Pension Ross Prague kohteessa Praha, Tšekki: Varaa nyt! 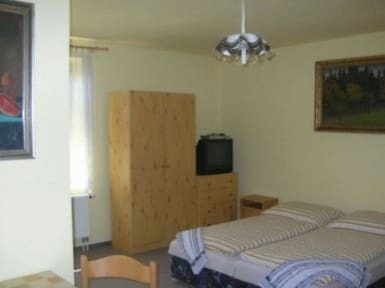 A-1 Pension Ross Prague is a great place to stay in Prague. Every room has private bathroom. It is located in a quiet residential area close to the centre. In our relaxed and friendly family-run Bed and Breakfast/Hotel/Guesthouse you can use a secure basement garage or park your car next to the pension on our garden. The centre of Prague is easily and quickly accessible thanks to near subway station Depo Hostivalocated on the (green) subway line. Within 3 minutes walk there are bars, restaurants, a bowling centre and a shopping center Europark, where you can find for example Interspar and OBI. On every room our guests can enjoy Sat TV including approximately 250 programmes in more than 40 languages. Wifi internet connection is available. In case of nice weather you can swim in our enclosed swimming pool (it is usually possible from May to September). Moreover, every room has a private bathroom with a shower and a toilet. Each studio (apartment) has in addition a kitchen area with stove and fridge with freezer. There is a breakfast bar in a passage including floor fridge with many drinks, for example famous Czech beer. Our accommodation is suitable both for long and short stays. If you wish, the breakfast can be served in the morning in the breakfast room (see pictures) for an additional 100 CZK (approximately 3.5 , according to the current exchange rate). We offer parking place in the garage next to the house. Swimming pool also belongs to the house. We can provide pick-up at the airport and other services. Hosts were really friendly and athmosphere in pension was great! You have to appreciate the lady of the house who woke up every morning to prepare breakfast for us. The only minus thing in Pension Ross Prague is, that it's quite far from city centre but metro is handful to use.